As a parent, there's always going to be moments that sting like a mutha flippa, when your child snaps something nasty at you - mine today was the moment my son (Blake age 6) turned around and said I never teach him anything. I do, of course I do - and I'm not just talking about the mum stuff we all teach our kids, I love to teach him things so much so that I actually looked at home schooling or flexi schooing (best of both worlds - a bit of school and bit of home school) I have a degree and I'd like that opportunity to be there should either of my children decide it's for them. I actually hated school but that was because of bullying (total geek girl with massive glasses and terrible teeth) and opposing to half of the system! - I went to a church school and we had to sit GCSE Religious education - our paper was written by the Church of England (back in the 90's) and didn't really include other religions so I didn't feel it was very interesting and it also meant that I had to sit the Dual Science papers rather than being able to do separate sciences for GCSE. I also had the major grumbles with choosing History, it was only afterwards that we were told that the entire 2 years would be spent studying WW2 - I'd loved and had (still do) great interest in ancient Egypt, Greeks and Romans so was a tad miffed! 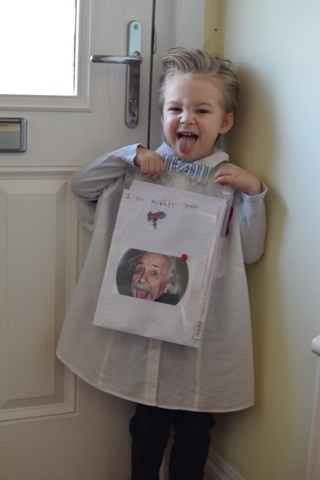 Anyway .. Back to Blake, the thing that really stood out to me was when he started to become interested in Albert Einstein - by the age of 5, I'd taught Blake what E=MC2 meant and an introduction to the theory of relativity - I'm pretty sure thats not something all mums teach their 5 year olds! By the time Blake was 3 he understood what an Author, Illustrator and Publisher were. And he's love for animals means I've taught him enough to have more animal knowledge than most grown ups do! I feed that kid's (and his sister's) imagination and mind on a daily basis! Telling me I don't teach him anything was a deep cut! Ouch!